Registration open for INSPIRE Internship Camp from 26th - 30th Dec 2018. 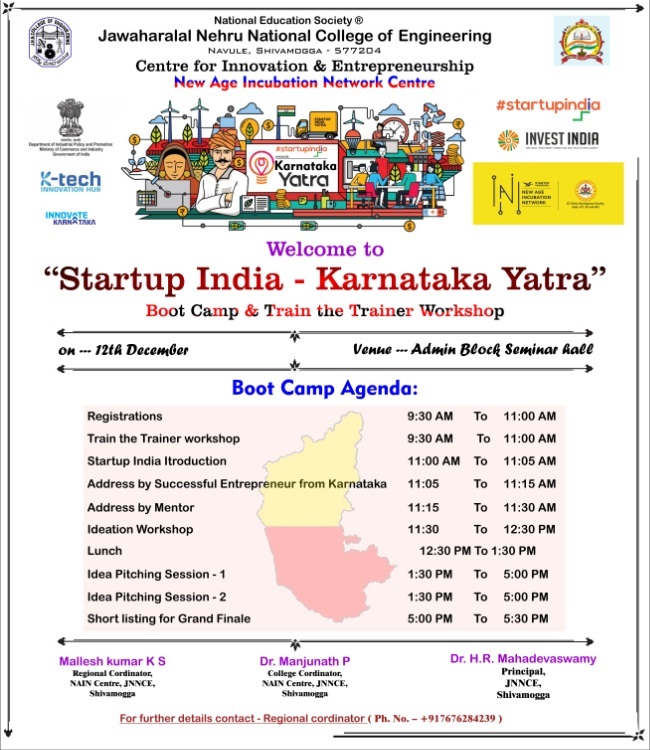 Center for Innovation & Entrepreneurship and New Age Incubation Network Centre presents "Startup India - Karnataka Yatra" Boot Camp & Train the Trainer Workshop on 12th Dec 2018 at Admin Block Seminar Hall. JNNCE Cordially invites you for the Curtain Raiser of Karnataka Tech-Entrepreneurship Summit - KTES 2019 on Friday, 7 Dec 2018. JNNCE, Shimogga is organizing “Karnataka Tech Entrepreneurship Summit 2019 (KTES-2019)” with theme to build strong start-up ecosystem and entrepreneurship spirit in tier-2 & tier-3 cities & will be held on 14, 15, 16 February 2019 at JNNCE, Shivamogga. 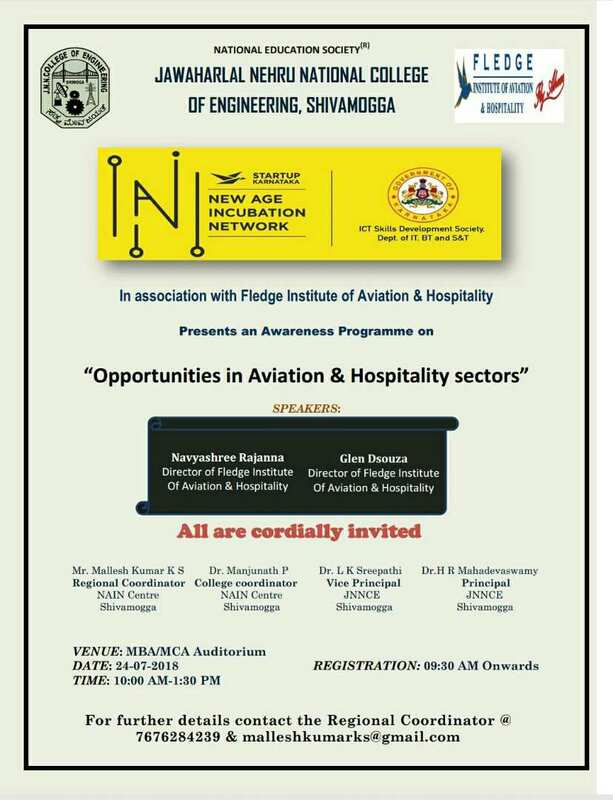 Make in Shivamogga on 19th Sept 2018. 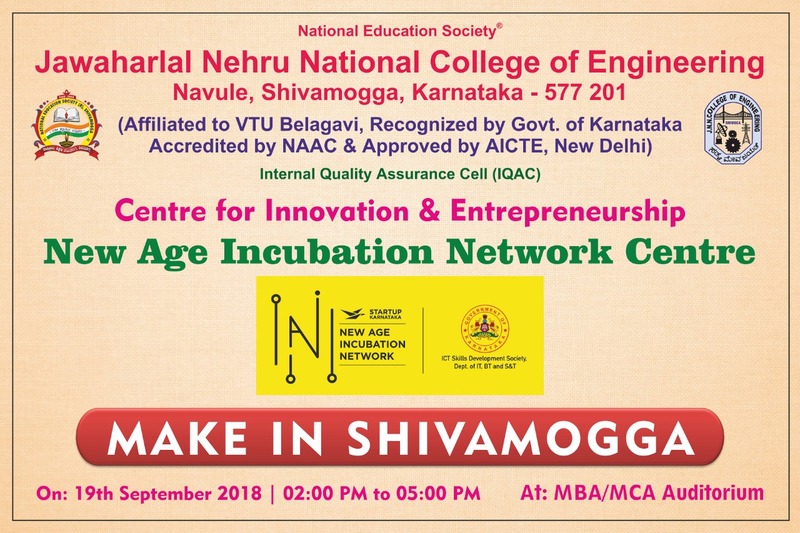 Centre for Innovation and Entrepreneurship - New Age Incubation Network Center- on 19 Sept 2018 at MBA/ MCA Auditorium from 2.00 P. M. to 5.00 P. M.
Faculty Development Program on "Image Processing and its Research Challenges"
Organized by Department of Electronics & Communication Engineering @ Seminar hall (Ad-Block), Computer Lab (ECE Dept. 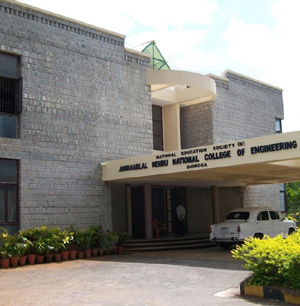 ), JNNCE, Shivamogga.